Dr Edward Wrench is so far best recognised for two reasons, firstly, his travel exploits to Europe and America, and secondly, from the earlier University of Nottingham blog post ‘Doctors, Diaries and Descendants’ which concentrated on his time in the Crimea and Indian Mutiny [some of his letters from India are currently on display in the exhibition ‘Threads of Empire: Rule and resistance in colonial India‘]. The 15 months spent so far (his handwriting can be challenging) transcribing the diaries which detail his rural practice has revealed a wealth and depth of family and medical history which is so often lacking from the records. They bring to life the richness of his daily routine and weave a bright and vibrant narrative of family life, through all its highs and lows. Edward Mason Wrench’s diaries which record his life in Derbyshire span some fifty years from 1862 to 1912 record his daily work and together create an important historical prism through which to examine but limited to society, the medical marketplace, rural community, family life, politics and domestic spaces. 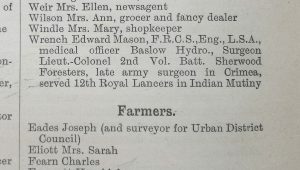 In 1862 Edward Mason Wrench decided to leave the army and to try his hand at General Practice. Within a few short weeks, he had purchased the Baslow practice which came with Park Lodge from Mr Condell, with a down payment of £300 and a further £100 to be paid within eighteen months. It was here he would settle and raise a family of seven with his wife Annie. In the crowded medical marketplace of the late nineteenth-century Edward Wrench had to quickly establish his reputation as a doctor. Holidays in the early days were rare. Doctoring the community was, however, more than just having the right medical skills. To be successful, a young GP had to quickly monopolise both the treatment of local wealthy patients and the growing number of public offices which were becoming prevalent. Wrench almost immediately found himself appointed a local union doctor and vaccination officer. Character was perhaps more important than skill and a budding GP quickly found that his public and private life were rapidly intertwined. ‘Had any one told me four years ago that I should take Annie as my wife in my own carriage to dine at Chatsworth in 65, I should have been puzzled to know how it was to be accomplished’. At the time of purchase the practice had suffered as a result of Mr Condell’s travelling with the Duke for long periods and was turning over a mere £300 per annum. Wrench’s hard work both at doctoring and nurturing the local community meant that by 1870 his annual turnover had risen to around £1,000. With a large family to feed, educate and cloth and a household to run Edward constantly worried about making enough money from a country practice. With no hospitals, Edward Wrench found himself treating a wide and diverse range of cases. Midwifery was lucrative but a tie, once engaged by a patient Wrench could not leave the practice around the date of confinement. 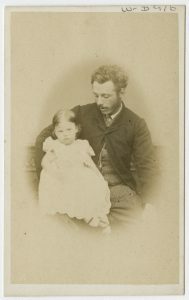 Some cases were incredibly complex such as removing tumours, repairing hernias, amputating limbs, dealing with accidents and trying to save children from diseases such as diphtheria. Those who lived and worked at Chatsworth provided a stable patient base but with the advent of the railway Edward was able to visit patients further afield, such as the Bright’s in Buxton who were charged two guineas for the consultation. Edward’s diaries contain a level of detail that is so often missing from history and paint a picture of a man who loved his wife, his work and enjoyed socialising with a diverse range of friends and colleagues. 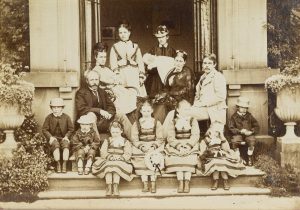 As I work on these diaries Edward and his family leap of the pages in a narrative which records, the excitement and wonder of scientific discovery, the grief of losing children, the cases doctored, the friends made and the ups and downs of living and working in Victorian Derbyshire. This is a guest post by Dr Carol Beardmore, who is researching rural general practice through the letters and diaries of late nineteenth century practitioners. The Papers of Edward M. Wrench (1833-1912) of Baslow, Derbyshire, surgeon, 1837-1956, are available to view in the Reading Room at King’s Meadow Campus. To make an appointment to view them or any of our holdings, please contact us. For more information about Manuscripts and Special Collections, see our webpage, read our newsletter Discover, or follow us @mssUniNott.